Researchers at Drexel University are developing an electrochemical flow capacitor (EFC) that combines the storage capabilities of batteries with the much longer cycle life and power output of supercapacitors. The team’s goal is to improve the stability of the energy grid and ease the integration of renewable energy sources. Renewables such as wind and solar power are experiencing an exponential year-by-year growth, but integrating such an intermittent and unpredictable power source into the grid can be problematic as it calls for a highly flexible, cost-effective solution that can store vast amounts of energy and release it quickly whenever needed. While batteries can store large amounts of energy, they cannot dispense it quickly and they can only survive about one thousand charge-discharge cycles. Conversely, supercapacitors can release energy in quick bursts and last for hundreds of thousands of cycles, but they can’t store quite as much energy. Recent advances in both battery and capacitor technology have been working toward a perfect marriage of the two. The EFCs developed at Drexel University are another step in this direction and are aimed at large scale usage. The device consists of a cell connected to two external reservoirs, each containing a mixture of electrolyte liquid and charge-carrying carbon particles. 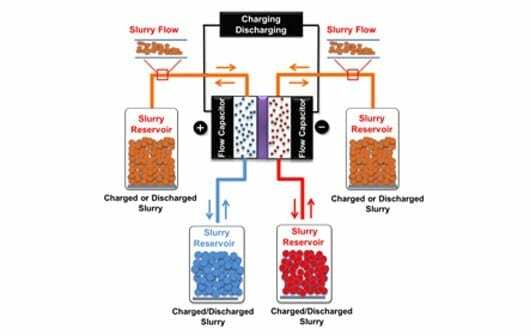 The uncharged slurry is pumped from the reservoir tanks into the flow cell, where the stored energy is transferred to the carbon particles. Once charged, the slurry can be stored in large tanks until the energy is needed, at which time the entire process is reversed.